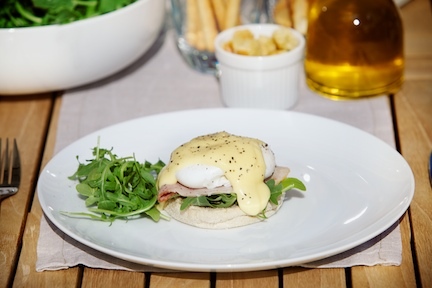 Because of their high butter content, some luxury high fat sauces such as hollandaise, choron, bearnaise, and Cafe de Paris are very difficult to make commercially. Chefs make high fat sauces using the roux technique and these are stable for the short period of time from preparation to plate. But if consumption is too slow the butter will rise to the surface and become seperated from the sauce. For a manufacturer looking to create something with the shelf life required by retailers this is, of course, impractical. But there are ways to ensure sauce stability at the luxury end of the scale. We can work with you on all aspects of new product development to ensure your luxury high fat sauces are a hit in the marketplace. Replacing egg yolk as the emulsifier has been the main focus of new product development in recent years. We have wide experience of the alternatives available and how best to use them. Using egg yolk as an emulsifier is fine if temperatures are kept below 50-60OC. However, if starch is used, or if pasteurisation is required then higher temperatures are necessary. Otherwise the egg would coagulate and its effectiveness as an emulsifier would be reduced. We can work with you to utilise emulsifiers which have been developed specifically for high fat/high temperature recipes. These emulsifiers need high temperatures to work so the water/milk (usually only water is necessary) has to be heated to around 60OC before they are added. The butter, fat, oil or cream is then added slowly and emulsified until a smooth cream is achieved. The starch is then added and heated until it thickens. Then, for declaration purposes, a small amount of egg yolk can be added but this should instantly coagulate so does not interfere with emulsion stability. Contact us today to discuss your new product requirements. Creating new luxury high fat sauce products is not without its difficulties. A number of problems can arise – but our technical team has the know how to help you overcome these. One problem which can occur is oil or fat leaking out of products. This can, of course, have a negative impact on product perception among consumers, especially those who are more health conscious. This type of leakage can also result in a loss of creaminess to the product. The problem usually lies in a lack of emulsion stability. We can help you work out what’s going wrong by examining the recipe and process in detail – including the level and type of emulsifier used. Graininess can also be a problem. This arises when too much milk is used and the sauce has been acidified using lemon juice or white wine vinegar. Contact us to discuss any issues you may be having with your products. Chefs, of course, demand that the best materials be used but some of these materials can be problematic in the manufacturing process – and expensive. We can help you reduce costs by advising on how to find alternatives to expensive ingredients or ways to avoid using them. Contact the team at KaTech to discuss how we can help reduce your costs.